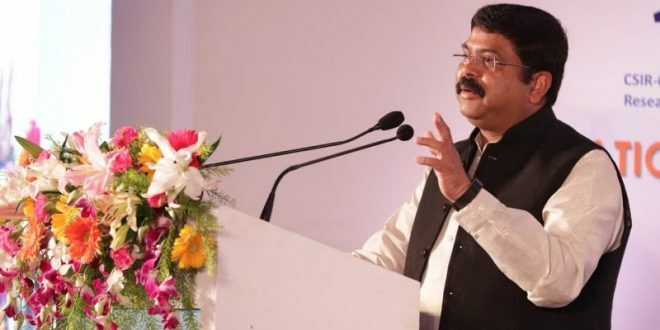 Bhubaneswar: Union Petroleum Minister Dharmendra Pradhan on Sunday launched the ‘Ujjwala Sanitary Napkin’ initiative in Odisha. Oil Marketing Companies (OMCs) will set up manufacturing units of Ujjwala Sanitary Napkins at the Common Service Centres across the state. As many as 100 local manufacturing units will be set up at Common Service Centres across all 30 districts, covering 93 blocks in Odisha. The cost of setting up these manufacturing units is Rs 2.94 crore. The move is expected to employ, educate and empower women in the state in addition to improving their access to feminine hygiene products. Training would be given to women in manufacturing and sale of sanitary napkins. Each facility will have the capacity to produce 1200-2000 pads each day. The CSCs are also being provided with raw material, enough to make 45,000-50,000 pads. These napkins will be priced at Rs. 40 per pack; each pack containing 8 pads. Each manufacturing unit will employ 5 to 6 Ujjwala beneficiaries thus providing employment to nearly 600 women across all districts.